Another month, another image contest and chance to win awesome prizes from the Source4Women community. UnitedHealthcare recently launched the Source4Women community back in July to help promote and encourage women to lead a healthy lifestyle. The new Source4Women community provides a myriad of healthy living information from nutrition, health screening and fitness tips to family and parenting information. In addition to this, every month from now until January they are creating a new challenge “daring” the community to share a photo of how they are staying healthy. 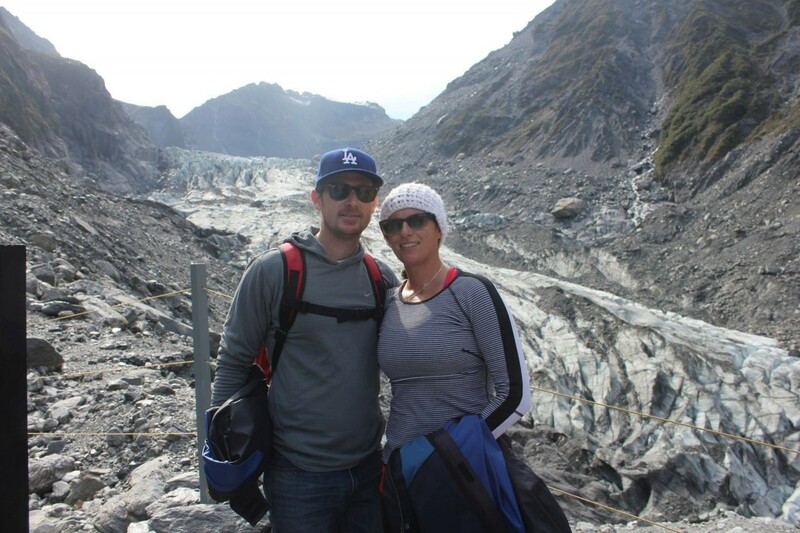 My husband Marion and I before we hiked onto the actual Fox Glacier. For the month of December, the dare is to get outdoors and get some physical exercise! I love that this dare comes during the month of Decemeber because it’s often the time where we are the least motivated to get outdoors and workout due to the cold weather. I don’t know about you, but it’s been fricking freezing here in Southern California. A low of 37 degrees at night? I just can’t handle it! I know my east coast peeps are probably laughing at me right now, but it’s true. I am a cold wuss. Even though I love to snowboard. Speaking of cold, I recently did something outdoors that was a great physical activity AND completed it in some cold weather. When my husband and I went to New Zealand over Thanksgiving. we did plenty of outdoor activities. The country is like a natural Disneyland with all sorts of hikes, caves, and places to explore wherever you go. One of the places we explored was Fox Glacier. Yes, we climbed a glacier! It was fricking awesome! The glacier hike was about 6k total. They gave us waterproof jackets, boots, thick socks, crampons, and waterproof bags and we were on our way. The glacier has been receding quickly and changes at a rate of 4 meters per day. Crazy town. When we hiked onto the actual glacier we strapped on crampons to our boots. I don’t know if you know what crampons are but they are these metal spikes that attach to your boot and help you grip the snow / ice. And wow, do they work. The last time I used crampons was when I hiked Mt. Whitney in 2007. Felt good to hike on the snow again. The photo you see to the right is the photo I submitted to this month’s Source4Women Gallery contest. It was taken right before we strapped on our crampons and walked onto the Glacier. We aren’t wearing our jackets because it was so fricking hot while we hiked that we took them off. But we put them back on before we got onto the glacier. The Zoo: What Can I say, I love Polar Bears! If these photos haven’t inspired you enough, I’ve teamed up with the folks at Source4Women to offer you a super awesome giveaway to get you motivated to get outdoors! 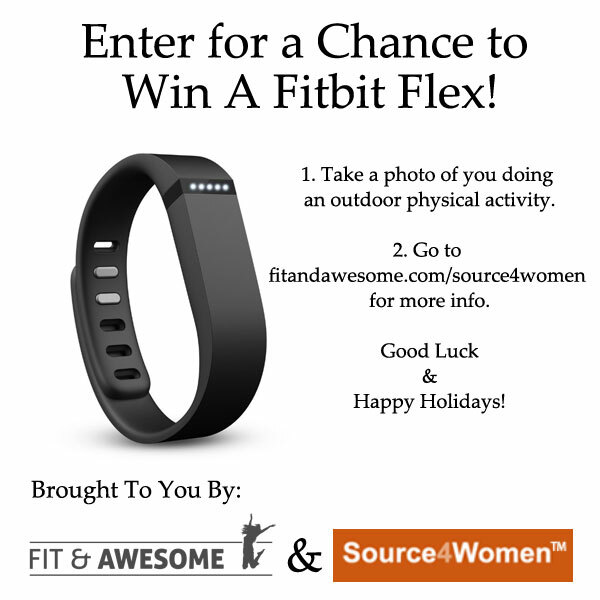 In addition to the $400 giveaway on Source4Women, you can enter on Fit & Awesome for a chance to win a Fitbit Flex. Um, can we say awesome? This is an exclusive giveaway only for my readers, so what are you waiting for? Get outdoors for some physical activity and post your photos! The new Source4Women community provides a myriad of healthy living information from nutrition, health screening and fitness tips to family and parenting information. I love X-Country skiing and snowshoeing for winter outdoor activities. I’m a weather wimp since moving from NY to CA but I do only enjoy running outdoors ( I despise the treadmill). There’s nothing like being outside for a run. It amuses me how few people will walk in LA or run outside. In the warmer months here in WI, I like to bike, hike, and take walks around the neighborhood and on my lunch breaks. In terms of things the fitbit could track — I looooove running and hiking. Other stuff? Spin, SUP, and yoga! i love love love running outdoors! and i’ll take the cold over heat and humidity any day of the week. Right now I love running and walking my dogs outside! I am a big fan the the cooler temps! I love running, walking, and hiking outdoors. I’m thankful to live where I can exercise outdoors year round. Fast walking and running is my fav. sport and I need to win this it’ll be very useful for me !!!! I love getting outdoor physical activity by running or hiking on nature trails. I like to bike and hike, yay for outdoors! I love riding my bike especially when we make it a family affair! I normally bike ride but have been down the ast four weeks with the crud! I go shopping, but since I don´t drive, I have to walk to where I need to get. They gave a fitbit at work to my hubby so in order for him to reach his goals, I walk with him every night for 40 mins. Too bad I don´t have my own to track how I do while we are not together, so… this is why I am participating. Thanks for the opportunity.